Creates bonds inside the matrix and seals the cuticle. Strengthens hair fibers and adds shine. Mask Application: Apply to mid-lengths and ends of towel-dried hair and work through. Comb through. Leave for 5-10 minutes. Schwarzkopf Professional BC Bonacure Repair Rescue. The potent formulas with Peptides nourish, restructure and repair hair from the inside out. The inner structure is fully replenished with renewed elasticity, resurfacing cuticles for remarkably healthy-looking hair with a soft silky feeling. 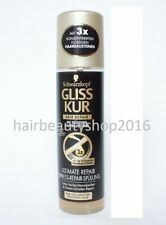 2 X SCHWARZKOPF GLISS KUR HAIR REPAIR WINTER RESCUE MASK. 200ml EACH. WITH LIQUID KERATIN. CARING REPAIR SERUM. 200ml EACH. BRITTLE, DULL HAIR. WITH LIQUID NUTRI-SILK. To use: Apply to the mid-lengths and ends of towel-dried hair and work through. Leave for 5-10 minutes and then rinse thoroughly. SCHWARZKOPF GLISS LIQUID SILK SHAMPOO & CONDITIONER. WITH LIQUID KERATIN. SHAMPOO 250ml CONDITIONER 200ML. BRITTLE DULL HAIR. SCHWARZKOPF GLISS TOTAL REPAIR SHAMPOO & CONDITIONER. WITH LIQUID KERATIN. SHAMPOO 250ml. CONDITIONER 200ml. Formulated with a high concentration of Proteolipids for their strengthening properties, the unique blend of Peptides, Amino Acids and Keratin visibly transforms the hair, increasing shine and manageability. 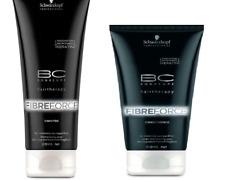 Schwarzkopf Supersoft. Supersoft Repair & Care Shampoo. Repair & Care Coconut Conditioner 250 ml. For visibly regenerated, supple and healthy hair full of shine. Application: Apply on wet hair after shampooing. REPAIR RESCUE. - Massage through lengths & ends. - Apply to the mid-lengths & ends of towel-dried hair and work through. - Provides long-lasting internal repair & care effects. PRODUCT DETAIL . It reinforces the benefits of Fibreplex technical service. View Related Products. Schwarzkopf Gliss Shine Tonic 100ml. Gives hair brilliant colour shine. The repair formula cares and gives shine. Schwarzkopf Gliss Shine Tonic 100ml - 6 Pack. REPAIR RESCUE. - Massage through lengths & ends. - Apply to the mid-lengths & ends of towel-dried hair and work through. - Provides long-lasting internal repair & care effects. PRODUCT DETAIL - Healthy strength, shine & suppleness. 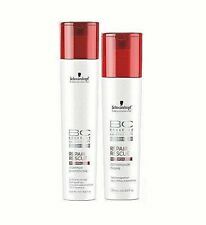 Schwarzkopf BC Repair Rescue Reversilane Shampoo 250 ml &. This gentle shampoo is sulphate-free and works to recreate bonds inside the hair matrix and seal the cuticle. It does this by utilising its patented Bond Connector Technology which deeply reconstructs and seals each individual hair strand restoring it to virgin hair quality whilst simultaneously making it 10x more resistance to breakage. Schwarzkopf Professional BC Bonacure Repair Rescue. Balm for Hair Ends 75ml. The Peptide Repair Rescue technology, Panthenol and lightweight silicone oils, ensure deep restoration and flawless hair beauty. Instantly detangles and improves manageability. Improves strength and elasticity. Softens and seals the hair surface. The bi-phase leave in-formula combines an efficient combination of ingredients that instantly improves the feel of the hair, leaving it soft and supple. We will always go out of our way to source the product you are looking for. We launched our online trading identity, Hair Heaven, back in 2002 and we were one of the first hair and beauty suppliers to provide online buying facilities. Schwarzkopf Professional BC Bonacure Repair Rescue. Refreshing Micellar Shampoo 1000ml. The potent formulas with Peptides nourish, restructure and repair hair from the inside out. The inner structure is fully replenished with renewed elasticity, resurfacing cuticles for remarkably healthy-looking hair with a soft silky feeling. 2 X SCHWARZKOPF GLISS. 200ml EACH. FOR BRITTLE, DULL HAIR. LIQUID SILK CONDITIONER. HAIR REPAIR WITH LIQUID KERATIN. HAIR AS SMOOTH AS SILK. What it does Smooths the hair surface. BC Bonacure. Hair Therapy. SEALED ENDS. With cell perfector and new reversilane technology instantly seals split ends and prevents them from occurring. Essensity by Schwarzkopf Repair Conditioner 200ml for Damaged Hair . Directions of use: • Apply to wet hair, lather and rinse. Need help or advice?. View Related Products. 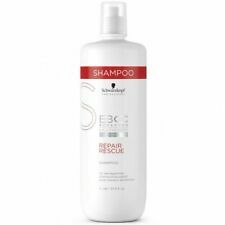 The shampoo rebuilds the hair structure, nourishes hair form the inside out, and leaves hair healthy looking. Schwarzkopf Professional BC Bonacure Repair Rescue. • revitalizes hair fiber. • smoothes coarse porous hair. Schwarzkopf Professional BC Bonacure Repair Rescue. leaves hair beautifully shiny and full of vitality. improves the quality of the structure of your hair. Leaves hair soft and full of shine. Original and exclusive health and personal care products.